Outrageously cute infant Christmas portraits are gifts that keep giving. Whether you are trying to save money by snapping Christmas baby pictures yourself or you plan to splurge on a professional photo shoot, the key to capturing adorable seasonal shots is to be prepared. There isn't a parent out there who wouldn't want photographic proof of her baby's first Christmas. The holidays are ripe for precious childhood memories, but just because the season is merry and bright doesn't mean that your child will be when you stick a camera in front of him. Don't be afraid to get up close when taking Christmas photos of wide-eyed infants. However, you don't want to get so close that you cut off key elements of the shot, such as baby's red Santa hat. Experiment with different angles, especially if your infant subject is posing on the floor. Kneel down to shoot at the baby's level. By dropping to the baby's eye level, the child will feel safer and more willing to allow you into his space. In addition, don't be afraid to contort your body while trying to capture the moment. Christmas is a joyful time, so embrace the seasonal spirit by incorporating holiday-themed props into the photo. Get creative when selecting props. For example, instead of dressing your baby as Santa Claus, place him in an elf costume or have him don reindeer getup complete with an adorable antler headband. In addition, consider using everyday items as cool Christmas photo props for baby. For example, a simple basket with red felt lining that says "Merry Christmas" on the front can be the ideal seat for an infant dressed like a candy cane. Likewise, an oversized Christmas stocking makes the perfect sitting area for a baby wearing a Santa hat. Simply slide the infant's body into the stocking, leaving her head exposed for a super cute shot. Timing is key when shooting an infant, regardless of the season. 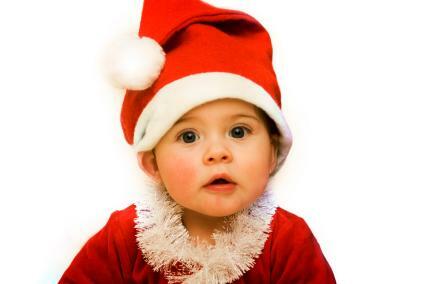 Your holiday photo shoot should be set-up according to the baby's schedule. Make sure the infant is well-fed and well-rested prior to the shoot or you will be shooting tears instead of smiles. Crib: Dress the infant in a cute holiday-themed outfit and place her in a decked out crib complete with Christmas lights and garland. Prop some stuffed animals around her, take the shot and add the following caption: "Merry Christmas from Our Crib to Yours." Gift: Get a large gift box and fill it with colorful tissue paper. Then, place your infant in the box and have her big brother hold the box top to reveal the "gift" of a baby sister. Beach: Instead of sticking to the traditional baby in the snow Christmas photo, consider snapping a beach-theme holiday picture. During your summer trip to the shore, dress your infant in a red swimsuit and Santa hat, then prop him up against a sand snowman. Bubbles: Place your baby in the bathtub or sink and place some rouge on his cheeks. Next, add a Santa hat on his head and a beard made from soap bubbles on his face. Pets: Dress up your infant in a Santa suit and place reindeer antlers on your dog's head. Pose the two in front of the Christmas tree or fireplace and snap away. If you absolutely can't get your infant to cooperate for a Christmas picture, then use what you have. Snapshots of your crying baby can still be used in holiday greeting cards, provided you use an appropriate caption, such as "You Better Not Pout, You Better Not Cry!" In a few years, you will look back at the shots of your screaming baby dressed in his Christmas best and smile.